Outdoor West organizes comfortable and safe yet challenging experiences at the level you want: Kayaking, biking, hiking and climbing. We have offer an opportunity to try out sport climbing: 'Introduction to top rope climbing' for kids, adulst and mature youth. 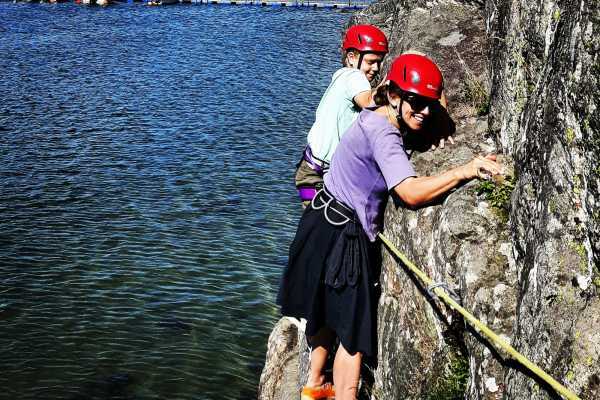 We also have family tours where we combine different climbing techniques with hiking and nature experiences. If you want to replace the top rope and harness, there is another technique in which you climb a low height, called bouldering, only using a crash pad (and shoes and chalk). For trips longer than 3 hours, a meal experience is included. Each activity begins with equipment testing. When it's time to get started, participants get a review of the necessary techniques and safety requirements. STRANDSITTAREN - Via corda, scrambling and the opportunity to try out top rope climbing. We move laterally along narrow cliffs, about 2 meters above the water level. Season: April-November Max 2 hours Age 3-73 years (with healthy knees and ankles). 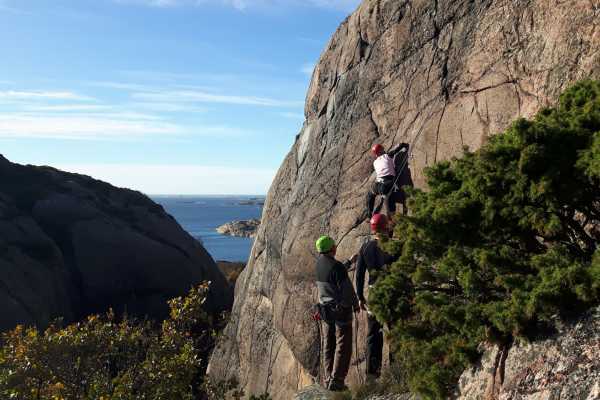 Klätterstig - Tour to the summit, hiking, scrambling and introduction to top rope climbing. Season: April-November Max 4 hours Age 7-77 years (with healthy knees and ankles). Season: April-November Max 4 hours Age 15-65 years (with healthy knees and ankles). Depending on the weather, an activity may need to be moved in time or space so that all guests can participate with confidence and feel safe. The crags must be quite dry to get sufficient grip and friction. It is always the guide/leader of each activity that finally determines where and how to climb, or if the activity has to be completely cancelled on the day in question. Stångenäset peninsula with its many granite crags has long been popular in the climbing coummunity. Climbing sometimes takes place in areas with wildlife sensitive to disturbance, and / or in private grounds, or in places that are shared with other practitioners of outdoor recreation. Therefore, it is important to take into account and concider the needs of plants, wildlife and other people. It is important to check the right of public access, climbing community access and to respect any ban on climbing and other acess. We have topos and climbing equipment for sale. In addition, you can rent from us ropes, crash pads and other things that are heavy or bulky to bring along on your holiday. • No previous experience is required but we assume that you have "normal" health (feeling healthy). If you feel insecure, consult your treating physician to assess if you can exert moderate physical effort. Contact us if you have problems with for example ankles and knees. • Time indications indicate start and last end time for the participants. Start and end times are partly adapted to Västtrafik bus lines 850 & 841 and ferry line 847. Preferably you arrive 10 minutes before start time so we can do the paperwork and fit your equipment. 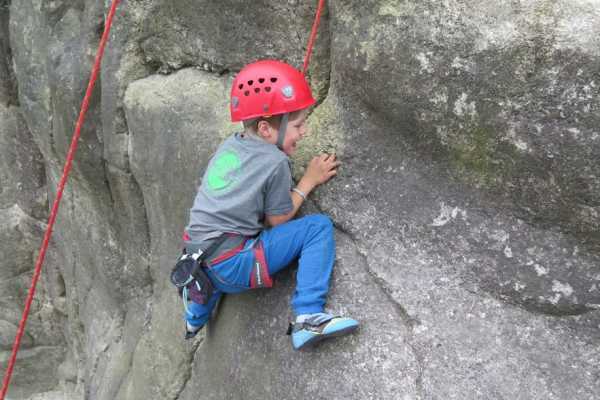 • Starting and gathering places vary between our different climbing activities. Booked participants will be notified a few hours before the trip, if there is a deviation from the booking confirmation.